All the practical information you need to know about Euroka campground. Euroka has 5 camping areas, each with its own carpark. Follow the signs to your camping area. Camping areas are walk-in tent sites only. Once you park, walk 5 to 15 metres to your camping area. The gate is locked between 6pm (7pm during daylight savings) and 8.30am at Euroka campground. For late exits, please phone 0421 529 001. A fee applies for non-emergencies. After heavy rain, the Glenbrook Causeway may be closed. Please contact the park office for more information. There are 5 camping areas in Euroka campground. Each area has a parking area available. Camping areas are walk-in tent sites only. All camping areas have unmarked sites, suitable for tents only. 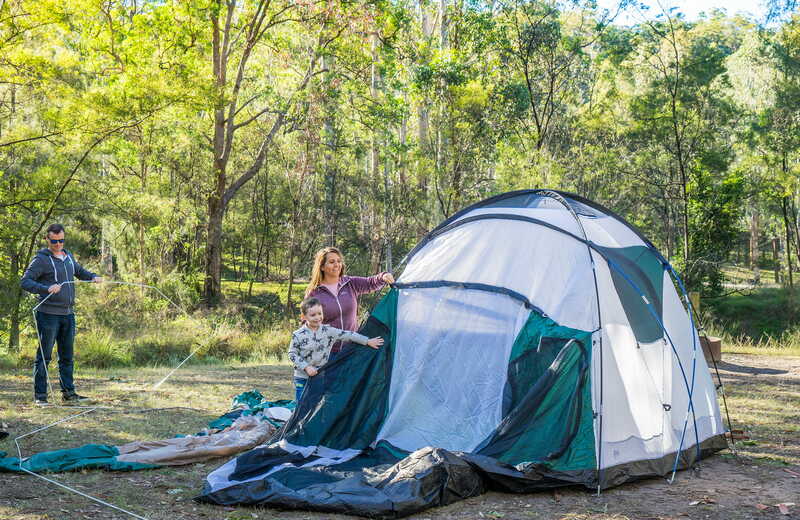 There are 5 areas within the campground: Appletree Flat, Bennett Ridge, Darug, Nioka and Red Gum. Up to 6 guests per booking. Call 13000 72757 for groups of 7 or more guests. The campsites have no power, and no shower facilities. A rainwater tank is available for general washing but is not suitable for drinking. You'll need to bring your own drinking water. Rubbish bins are available. Please take your recyclables home with you. There is no mobile phone coverage. A public phone is located at Glenbrook. Flush toilets are available at the park entrance. Assistance may be required to access this area. The ground can be uneven. Toilets are wheelchair-accessible. Amplified music is not permitted. Please be considerate of others and keep noise to a minimum. Noise restrictions apply from 10pm. Campfires are prohibited, but wood barbecues and fire rings are available for cooking. Firewood may not be collected from the park, so you'll need to bring your own supply.